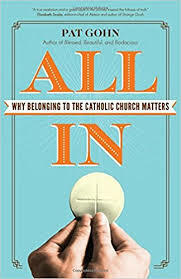 Are You "All In" When It Comes to Your Catholic Faith? What’s your relationship to the Catholic Church? Are you devoted? Dedicated but doing the minimum required? Dabbling? Discouraged or done with the Church? Unsure? In All In, Pat Gohn invites readers to reconsider their relationship with the Church, whatever that relationship might currently be. The concept of Church as the Mystical Body of Christ, the importance of love of neighbor, and respect for the dignity of the human person are also discussed. Gohn invites us to “view each day with an eternal perspective.” Being part of the Church matters, not only in this world, but also the next. Gohn, who has a master’s degree in theology and certificates in adult faith leadership, theology of the body, and spiritual direction, offers solid theological reasons for making our faith and the Catholic Church the main priorities in our lives. In addition, each chapter concludes with an invitation to deeper prayer, suggestions for further reading, and activities to deepen one’s faith. The Catholic Baby Name Book is now available on Kindle! Expecting a baby and aren't sure what to name the new blessing? Searching for a Confirmation name? Writing a story and looking to find the perfect name for your character? If so, you'll be happy to know The Catholic Baby Name Book is now available for Kindle. The print edition is also still available and makes a great gift! Every young woman should learn to chart their cycles. I didn't take a Natural Family Planning Class until I was 21. It was such an eye-opener for me. I had suffered from depression all of my teen years (still do), but had never associated it with PMS. I had short cycles which meant I had my period for a week, a couple days of fertility, and then two weeks of PMS with its corresponding mood swings. I remember thinking, "How could it be PMS when I just finished my period?" but that is exactly what it was. Having that information was empowering. At least I understood why I was feeling so horrible. Just knowing that made a world of difference. It doesn't change the horrible feeling or take away the cruel recording in my head that tells me I'm worthless over and over, but I know that isn't the real me, that it's just the hormones talking. This article explains how teaching girls to recognize their hormonal shifts can help them stay out of trouble due to anger and depression as well as avoid sexually irresponsible behavior. While this article doesn't discuss it, it can also be useful when they do get married to help them know how to achieve or avoid pregnancy. It can also help when talking to health care professionals if something is going wrong with your cycles. You'll know there is an issue right away. This quilt took me a bit longer than usual. I've been working on it for over a year and a half, but I finished it today. My daughter claimed this one for herself as a cozy quilt to use while she watches TV on the couch in the morning. It is primarily a scrap quilt. I needed something to use up leftover fabrics from other projects. I have some scrapbooking to do the next few weeks, but then I get to start planning my next quilt project. It's hard to believe I've been doing this for the past 18 years! In nine years, I’ve never gone into my Catholic Mom’s Bible Study / Book Club and said, “We need to read this book today,” but I did that with the latest book by Kate Wicker. If you are always perfectly fulfilled in your role as a mother and you have a group of well-behaved children who never try your patience, feel free to stop reading this review right now. If, on the other hand, you struggle with your God-given vocation of motherhood and sometimes feel like a total failure, then you will want to put “Getting Past Perfect: How to Find Joy and Grace in theMessiness of Motherhood” at the top of your reading list. Each chapter begins with two contrasting quotes. One is an “Evil Earworm” that the world (or the voice inside our head) tells us. The second is an “Unvarnished Truth” giving us a much-needed dose of reality rooted in God. 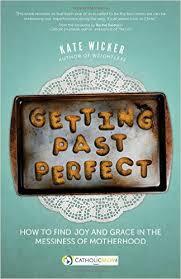 Wicker, a mom of five, offers refreshingly honest anecdotes from her own life to illustrate her points. She freely shares where she has gone wrong and how she could do better. She doesn’t have all the answers and describes herself as a “perfectionist in recovery.” She is in the trenches with the rest of us. Reading “Getting Past Perfect” is like sitting down with one of you best faith-filled girlfriends to have an honest heart-to-heart about life and motherhood. A Reading Guide is also included for use by individuals or groups.